Hajimemashite! I am the Dancing Chef Kumigar! This is my first blog entry on GaijinPot and I can not hide my excitement to be here! Big thanks to the GaijinPot crew to inviting me as a part of the blogging team! ARIGATO!! Before I introduce a couple videos of mine, I want to share a story that reflects who I am, cause I am pretty sure there are some curious people reading this. 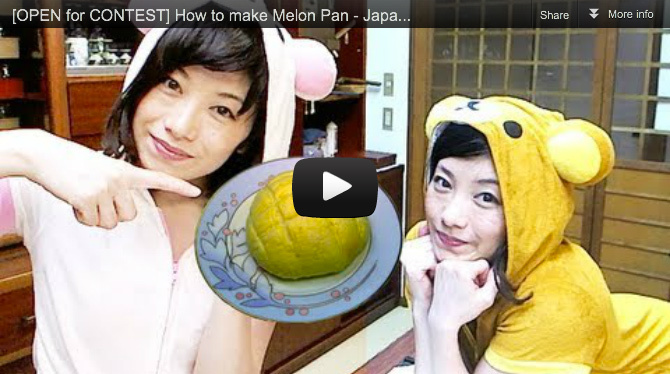 So I have been making cooking/baking related how to tutorial/recipe videos on a weekly basis since May 2011. I was one of those people who got affected by the consequences of 3.11, and so many changes took place in my life when I least expected. I lost my job, my place in Tokyo and a lot of freedom that used to spoil me, which includes hitting all the deep house mecca in Tokyo that was like attending a church for me. Overwhelmed by all the changes that were happening in Japan, I knew there were some missions for me to engage in and for Japan to bring positive energy for the heart-aching country, but I just did not know how to maintain a positive mental attitude. When I thought I had nothing left within me, I realized that I still was able to express my gratitude for the people and life thru the art of cooking and baking in the kitchen of my parent’s restaurant, which has been running for over 85 years as a traditional family restaurant specialized in carp fish. At first it was my intention to let my friends overseas know that I was dealing with the consequences of 3.11 okay, and I made my first baking video, but this video got relatively high views for a YouTuber with less than a 100 subscribers, and this video got me a status as a YouTube partner in the following month. Then I thought “this is IT!”….I thought that by sharing videos that portray rather positive mental/emotional attitude regardless of what has happened to me in my life, I could maybe make some difference… maybe inspire a friend or two. I am a big believer of the power of intentions and mental commitment that we make in our actions, and I thought that it was my first step trying to let my inner voices echo regardless of the size I maybe able to influence, and I needed an excuse to make me stay positive to do the weekly video uploads exposing my identity online anyway. So this is how it all started, but everything I needed to communicate to the world gradually fell into my hands just like some people say “everything you need will be given to you, and all you need is ask”. By the time the game was over, it was already morning, so I took a few hours of nap, and just like any other days, I went for a 11km run. I was so inspired by Japan’s victory that I was thanking Kamisama for the big miracle we totally deserved and needed. By the time I was done with my running, I was so motivated probably from the adrenaline rush and everything LOL, but I felt that it was my turn to try making some brave moves and I remembered about the contest, and although the deadline of the entry submission was 8 hours away, I thought I really had nothing to lose, so I started making a video and submitted it only 5 or 10 minutes before the closing deadline. I think that my passionate and very honest emotions that I sealed in my actions allowed me to become one of the winners, and I was able to attend the creator camp sponsored by YouTube/Google at the Digital Hollywood University in Akiba for a week, and my missions on making improved quality videos began. Phew, are you guys still with me? So I am still making cooking/baking videos, at the base of Mt. Fuji, and ever since I became an active YouTube Partner, my channel size grew thanks to all the people that have believed in me and supported, and today, I have over 13,000 subscribers and 850,000 views. With all the nuclear power plant radiation crisis, Mt. Fuji eruption and mega-quake concerns in Kanto region, all of us are still forced to live with uncertainties in life with a lack of safety guarantee, and I think it is not just me that these concerns drive me crazy. I want to introduce a couple videos that I made after my personal re-realization and making a decision to do the 6 months project featuring traditional Japanese sweet buns, Cream Pan and Melon Pan! Thank you for reading and checking out my videos! Please do not forget to SUBSCRIBE and follow me on Facebook, Twitter, Google+ and check my personal blogs at Kumigar.com! One of the YouTube NextUp Japan 2011 contest winners, Kumigar aka Kumiko is a free spirit, bilingual Japanese chef/artist/vlogger/reporter/activist who enjoys sharing cooking videos of her creatively designed recipes bringing humor and an unique video editing style into the art of cooking to entertain viewers from all over the world.